Stories of life, growth and perseverance in dour and desperate neighbourhoods are undoubtedly worth telling. The nooks and crannies of experiences otherwise overlooked by mainstream culture are often rich with opportunities for pathos, expression, and diversity, and as citizens we all ought to champion stories of the oppressed and disregarded. Arinzé Kene’s Good Dog (2017) is certainly one of these stories. It is not, unfortunately, a compelling or engaging piece of theatre, and for all its noble intentions, the flaws in design and execution are too great to overlook. The play is a one-hander, with a runtime of two and a half hours. 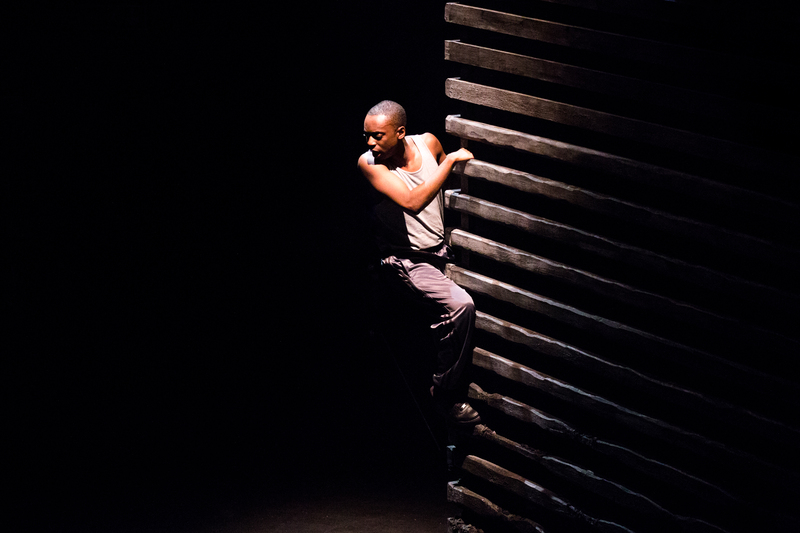 In the Traverse Theatre’s staging, directed by Natalie Ibu, actor Kwaku Mills portrays Boy, the sole character onstage, who narrates this sprawling, multi-year tale as he grows from a young, bullied child to an older, disillusioned and distraught teen. The story focuses on a dreary street in Tottenham, north London, on which despondent drunks and anxious shop owners face off against violent youths and, from time to time, the long arm of the law. Boy observes these disparate characters with intrigued attention and with the help of various voiceovers his narration layers the street with detail. The twists and turns of Kene’s script cover myriad subjects of life in this place and in his time, from South Asian immigrants trying to live up to their forebears’ expectations, to local infidelity, to racially problematic beauty standards, to concepts of nonviolence and protest, to undiagnosed dyslexia in impoverished youths, to 90s-centric toys and technology. The visuals are mostly dark, harsh shadows, enveloping Amelia Jane Hankin’s stark set: a blunt, grey cube in the center of the stage that resembles nothing so much as a kid’s (tower) block , but evokes the air of unpleasant, grungy decay that seems to envelop the whole place, at least in Boy’s eyes. As Kene writes him, and Mills plays him, Boy is the center of all the world’s woes. He is mercilessly bullied in school. His mother both cannot afford to and seems uninterested in buying him the amenities he desperately craves. He seems to have no friends, no confidence, and in everyone’s eyes but his own, not much of a future. When the audience first meets Boy, he is an outspokenly optimistic kid, who believes that if he does good, ‘good’ will circle back to him later in life, and so he willingly undergoes derision and torment at the hands of local bullies, and others, because the more he forgives them, the better his life must eventually become. It does not take long, however, for the cruelties of life in this area to drag him so far into crippling misery and senseless pain that the fable of ‘good things coming to those who wait’ starts to ring completely hollow for Boy, and he realizes that letting the onslaught of life beat him down is never going to liberate him. It was only going to make things worse. Midway through Good Dog, the audience may feel the same. Not only because the central metaphor of Kene’s script (a pair of dogs Boy observes clashing with each other over many years) is so obvious that its eventual payoff could have come 90 minutes earlier without any meaning lost, but mainly since this production is long, exhausting, and clunky. The sound design, by Helen Skiera, is cacophonous, grating, and more inane than affecting. The choreography of Boy’s solo performance, whose movement was directed by Annie-Lunnette Deakin-Foster, is disorienting (see Boy inexplicably leaping on and off the grey block while he walks around, which happens a lot). Mills’ accent, assisted by dialect coach Joel Trill, was noticeably strained and inconsistent, so that Boy sounded like he was warming-up in rehearsal, well way from the street and . Technical elements smack of artifice and there’s that uncanny smugness that much of contemporary British theatre seems to be slipping into. It is remarkable that Mills was able to learn two and a half hours worth of lines and movement and perform them onstage on tour. One wishes, however, that the lines and movements were not as derivative and staid as these. The character seemed a strange fit for Mills’ talents and overall his performance was wasted. This is understandable, however, given Kene’s script, as that is the weakest element of the production. The tone and content of Good Dog are suffocatingly bleak, and lack both a sense of humour and an ounce of self-awareness. The phraseology Kene employs is labyrinthine and more irritating than anything else. A few thin jokes about naughties nostalgia got a snicker here and there, but the one genuinely hilarious and surprising moment came when a supporting character dies in such an improbable and horrifying manner that the show’s claims to authority or seriousness were dashed in full there and then. The death in itself is, of course, not intentionally funny, but brutally tragic, and yet as this piece is written, each scene seems hellbent on topping the last one with even more misery and suffering, and the showy depravity of this character’s final moments can do nothing but amuse. Good Dog is coated in emotional squalor – a poor and baffling choice. Most of Kene’s narrative seems more interested in simply shocking an audience into stupefied submission with ‘Look how sad this can get’ antics than telling a story in a creative or engaging manner. It is telling, and rather depressing, that this script has been picked up and praised by critics. From my point of view – and, ok, I don’t know London’s meaner streets – it sounded very contrived and ends up with the most incompetent portrayal of a marginalized voice that I have seen. Which is a shame, because again, stories such as these frequently offer important perspectives, which others should listen to. But Good Dog ends up taking all the worst elements of ‘important’ dramas and shamelessly repeating their most self-serious moral mantras so that they come off as painfully obvious by the time Boy utters them. Of course, much of the subject matter the show deals with is hugely important but nearly all of it has been handled more intelligently and dynamically in narratives like Barry Jenkins’ Moonlight (2016), Strictly Arts Theatre’s outstanding Freeman (2018), and Spike Lee’s Do the Right Thing (1989). This last connection is especially relevant, as Kene chooses to include a riot sequence at the end of Good Dog so reminiscent of Lee’s Do the Right Thing climax that it seriously threatens to overstep the bounds of homage. Visit Edinburgh49 at the Traverse archive. The effect of armed conflict on the already fragile male psyche is a deeply fascinating subject. Anna Jordan’s The Unreturning takes a timelessly important issue — the return of the soldier from war — and creatively explores touching and interesting variations on what these returns mean and have meant through time. Told through three constantly overlapping and intersecting storylines, the play paints a gripping and tragic picture of the collision of memory, trauma, and men who will never exist the same way again — for whom a true ‘return’ is impossible. Performers Jared Garfield, Joe Layton, Jonnie Riordan, and Kieton Saunders-Browne take on the production with intense spirit, and compellingly elevate Jordan’s impactful choice of subject matter. One will truly feel moved by the real-life implications of the play’s content, such as meditations on the legacy of war crimes, the role of friends, family, and average people in the return of discharged members of the military, and how truly detached so many of us are from the experience of war. This play is produced by Frantic Assembly, a group both admired and infamous for the wall-to-wall physicality of their shows. The Unreturning plays to their strengths in many respects; the extensive and balletic movement all four performers put themselves through over the course of the three stories are a marvel to watch, and embed the stories with clever visual connections. The structure of the show is at its best when the three stories overlap in direct parallel to each other, such as a sequence near the beginning when all three board or initiate their respective transports ‘home’ — home in each case being Scarborough. George (Garfield), boards a train; Frankie (Layton) sits in a cramped plane next to sunburnt tourists; Nat (Riordan) barters with Norwegian boatmen to smuggle him into a war-torn United Kingdom. The parallel is revisited in a breathtaking setpiece following the three men as they wander around the area, each distraught for their own reasons, and deliriously visit Scarborough monuments and landmarks; they stand next to each other onstage, separated by time but alike in their disconnection from what is meant to be their home. George, you see, is returning home after armistice in 1918; Frankie has been discharged for committing a hate crime in Afghanistan in 2013; Nat is searching a bombed-out Scarborough for his brother in 2026. Yes, 2026. The third storyline takes place in a (presumably Brexit-induced) war-torn futureworld, where everyone’s information is publicly displayed by the government, people are wanted for ‘Dissent,’ and everything has completely gone to hell. For all the immense emotional intelligence at work in The Unreturning, this aspect of Jordan’s script, along with director Neil Bettles’ over-reliance on the overcomplicated revolving set, render a great deal of the actual stage time irritatingly silly. For although the subject matter is compelling, the tone and pace of the Frantic Assembly approach are a poor match. The breakneck energy, high-bravado set-changes and head-spinning multi-roling repeatedly jar against the profundities of the story, producing deeply unfortunate moments like a floating hat and dress cartoonishly symbolizing George’s lovestruck wife, or the discordant wiggling the company members return to over and over when George experiences haunting flashbacks or Frankie succumbs to substance abuse. The show has a lot of wiggling. This is not always a bad thing, of course, though it seems to be Frantic Assembly’s bread and butter. To evoke a shaky memory, the actors wiggle. To show the passage of time or space, the actors wiggle. To recreate a pub or a discotheque, the actors wiggle drunkenly. All this wiggling is finely choreographed and expertly executed, but the main result of it all is a simple: why? Why take so much focus away from the intriguing narrative elements to just move around like spaced out dancers? It is pleasant, impressive movement, but mostly has very little to do with the gravity of the situation — like if a bunch of mourners started breakdancing at a wake. Sure, it’s impressive, but is now the time? When the wiggles pause, and moments of achingly tender performance are allowed to play out, the talent is notable. Garfield, in particular, imbues George with a brilliantly measured depth, wherein he visibly wrestles with both his wartime experience and anxiously rethinks every aspect of the rest of his life. Jordan’s script detracts from itself, especially early on, by piling far too many profound statements on top of each other in nearly every line, yet Garfield turns most of them into affecting ruminations rather than fortune-cookie-esque dictums — his parable about the Christmas day truce near the middle of the show is the performative high point of the piece, without a doubt. Layton is also an electric performer, who displays expert timing and delivery every time he is onstage; while Frankie has much less multi-dimensionality than George (the supposed ambiguity of his character’s racial crimes are a weaker element of the script), Layton nevertheless leaves a lasting impression as a versatile actor. This is not as true for Riordan, who is outmatched by his fellow actors; the 2026 storyline he leads is, again, incongruously silly, and Riordan deserves credit for the desperation and consistency of his take on Nat’s miserable trajectory, but overall he does not bring enough verve to a storyline already lacking justification. Saunders-Browne, playing various supporting parts, does a solid job bouncing around so many characters and time periods, and in his case, the future-set monologue he delivers late in the show is thankfully not so opaque as the rest of that storyline to overshadow his well-measured delivery. Overall, The Unreturning is a curious example of a potentially mismatched writer and company. Yet, aside from the more incongruous choices onstage, the performances are memorable and affecting, the treatment of the subject matter is mostly excellent, and one can easily overlook the weaker elements in favor of a truly noble intention. In the genre of ‘home drama’ (call it neo-kitchen sink realism), blood relatives screaming devastating jabs and hurling haunting revelations back and forth feels oddly natural; what kind of play would deny an audience their fair share of soul-baring conflict and painful familial reconciliation when there is literally a functioning washbasin onstage? Claire Duffy’s new play Arctic Oil both soars and drops as it follows this particular approach to dramatic storytelling. It goes high, with its airtight atmosphere and its dialogue’s sweeping scope, and achieves a good deal. However, Duffy’s script, while clever and relevant by all means, flaps a few times too often, mixing stale melodrama into its more striking twists, and thereby takes the air out from under it. Not much harm comes of this, for actors Neshla Caplan and Jennifer Black are very capable of holding the audience’s attention and heartstrings as necessary, and imbue their respective characters with internal torments and desires. Caplan is Ella, an activist and young mother struggling with existential guilt for staying at home to raise her baby, Sam, rather than fight the forces of capitalism alongside her more daredevil comrades. Black is Margaret, Ella’s entirely different-minded mother — or so it initially appears — a woman so concerned that her daughter’s activism will cause irreversible damage to herself and her son that she takes her worry to uncomfortably strict lengths. Set on “a remote Scottish island,” it’s all contained within a pristine bathroom, in which Margaret has chosen to lock Ella and herself so that Ella does not pursue what might be a fatal mission protesting an oil rig. As with any home drama worth its salt, while the characters spar and try to explain their side, accusations of abandonment, betrayal, and shoddy parenting fly, harrowing family secrets are uncovered, and certain thematic topics are eventually revealed to have been proxies for familial resentments and personal demons. Climate change gets a number of notable and nod-worthy statements, but the political discussions melt away fairly quickly into allegories for generational divide and reconciliation with past wrongdoing between mother and child. The effect is literary, but rather loses the environmental focus of the first half. Director Gareth Nicholls builds the rage and personal angst but once the initial shock of the play’s claustrophobic setting has worn off, and apart from one or two sharper later moments, a sense of what is important goes missing. In particular, one ill-measured fakeout sequence near the middle is so hammed up that whatever energy the play had been coasting on is visibly squashed for no discernible reason, other than melodrama. Less successful is the uneven and unnecessary musical underscoring. The soundtrack mostly consists of glum electronic hums and whirs, which does set the tone at the beginning, layering the fateful onto the domestic surfaces. Frustratingly, these sounds are brought back again and again and again, undercutting some interesting dialogue and generally siphoning the clarity out of the show . The use of music seemed like a safeguard against the audience possibly not understanding that a conversation was ‘Important’, but in reality, Duffy’s characters and the skilled performances are capable enough on their own without the heavy-handed signaling. Arctic Oil uses mother and daughter in conflict to cut through to political topics of current consequence. Its conversations are difficult and compelling but do force inconsistencies into the drama. It is, regardless, an intelligent piece from an ambitious team. 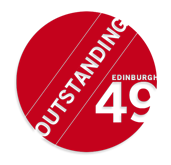 Go to Edinburgh49‘s Traverse archive.